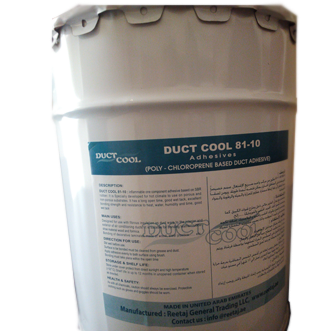 Duct Cool PIR is Polychloroprene rubber based one component adhesive based on special tackyfier and additives. It is specially developed for polyurethane, phenolic and polyisocyanurate (PIR) foam in air duct system. It is very good in film forming nature which gives uniform bonding to most of substrate like cross-linked polyethylene, EPDM & similar substrate. Glue 81-10 adhesive is a low cost, quick setting synthetic elastomer adhesive for use with fibrous glass insulation (up to 3 lbs. /cu.ft.) duct wrap and acoustical linings for air handling ducts. Synthetic ADHESIVE meets ASTM C916, Type IV (ASC-A-7001-A,Type IV) and NFPA 90A and 90 25/50 requirements. Synthetic adhesive contains no asbestos, leads, or mercury compounds. 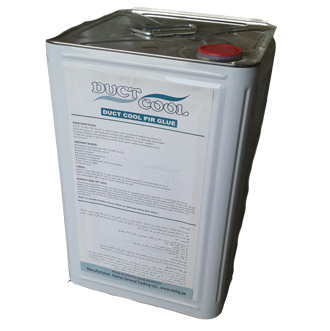 Duct Cool R 242 is a solvent-based adhesive developed specially for Nitrile Rubber Insulation Material and closed cell foam insulation. 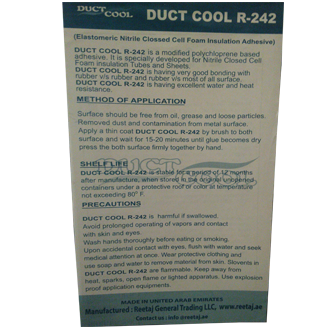 Duct Cool R 242 is made from combination of special resins & additives that produces extremely low odor and provides excellent tack properties along with a very strong bond.